Write Up: This studio consisted looking at train networks of Ohio and the Midwest. This shows the first two assignments that explored local destinations and current freight networks. Columbus Destination: My first attempt at Columbus Destinations exercise left a little more to be desired (1, 2). My professor tells me to go back to the drawing board and to present the information in a better and more graphically pleasing way. I took a moment to look at the information I had and combined it with colors and methods found in Nick Feltron's portfolio to come up with something that was more successful. The information was simple. I asked a sample of people from a varying array of demographics in Columbus where they go often in the city and where they would go over the weekend regionally. Each map illustrated a relationship of the important destinations through the typeface size and geographic relation to a geographic center of Columbus. This led into further investigations for trains in Ohio. 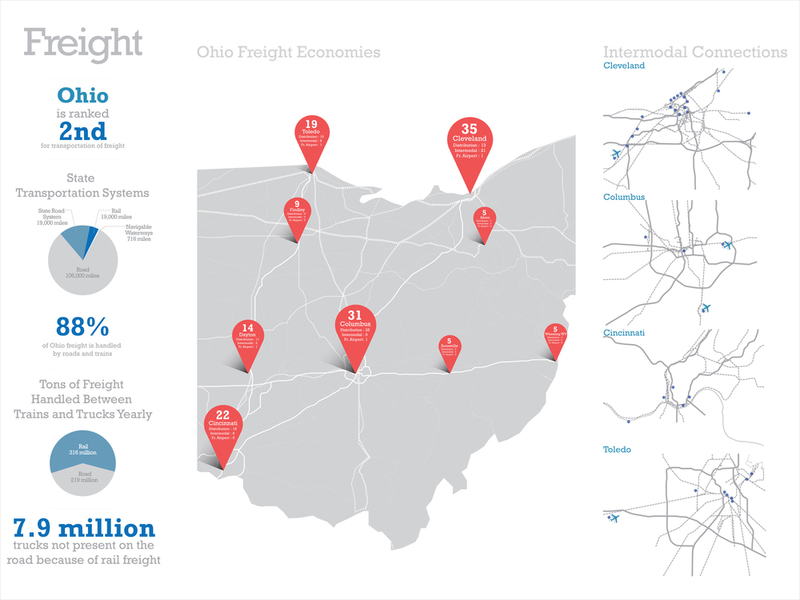 Midwest Freight: This studio project investigated how train networks could benefit the economic sectors of Ohio. Elaine and I were in charge of looking into major businesses and freight network in the region. This was an interesting investigation purely from looking at what top American companies operated in Ohio and region. With 36% of the Fortune 500 companies located in the area, trains could help move people around efficiently compared to planes or automobiles because travelers would have more convenience and the ability to multitask. The more fascinating part of this project came from the freight networks in Ohio. We found out that freight is a very cost effective way to move goods and something that is expanding in the state today. What our proposal included was bridging the gap in the freight network by expanded it into the southeast region of the state that seemed to be the missing link. In addition to the research, the goal was to have a well composed graphic style. We chose the more modern serif typeface, Rockwell, integrated it into a pallet of red and blue that complimented our research well. For only a week and a half, this was a successful project.